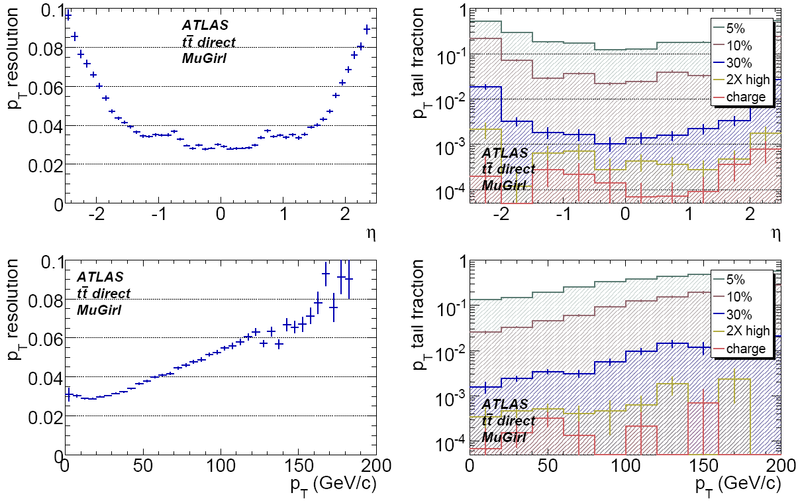 The combined muon performance plots below are approved to be shown by ATLAS speakers at conferences and similar events. Please do not add figures on your own. Contact the the muon combined performance coordinators (atlas-perf-muons-conveners@cernNOSPAMPLEASE.ch) in case of questions and/or suggestions. 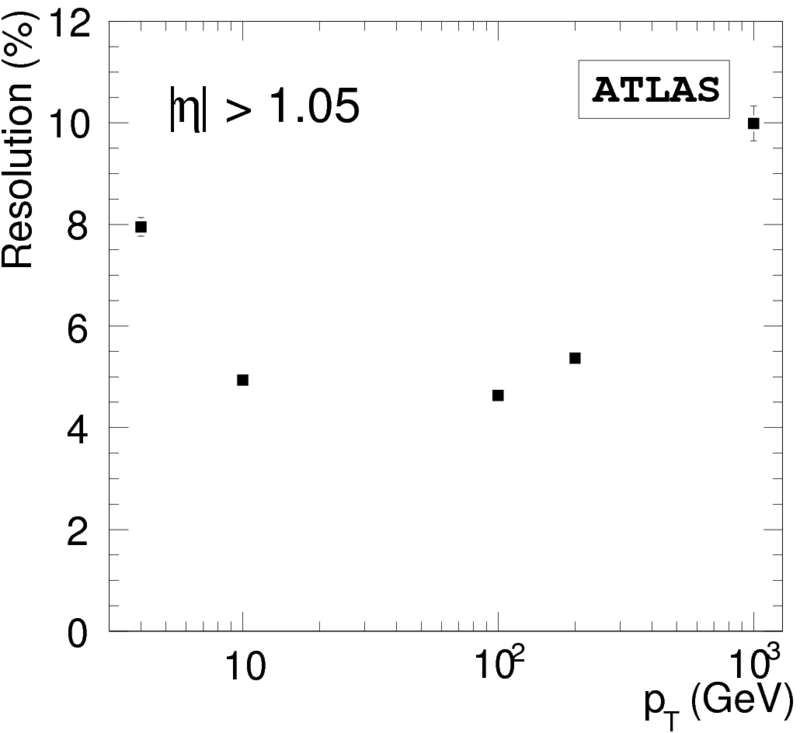 To avoid the duplication, all muon performance plots and plots from the ATLAS technical paper are located on the corresponding muon spectrometer page. 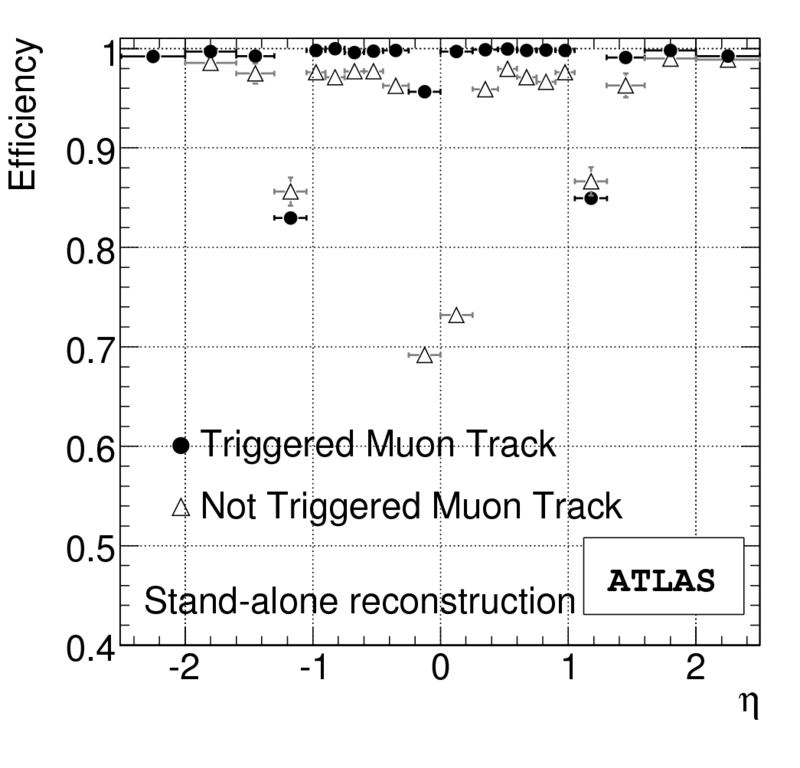 all = stand-alone + combined muons + inner detector tracks tagged by track segments in the muon spectrometer. 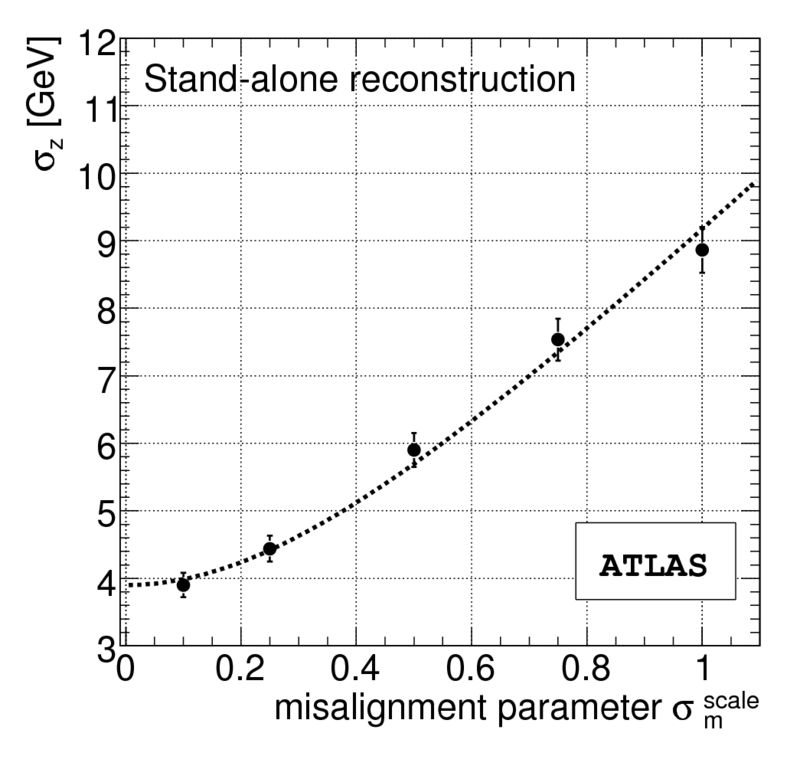 Section "Muon Reconstruction and Identification Performance in ATLAS: Studies with Simulated Monte Carlo"
Fig. 1: The ATLAS muon spectrometer. Fig. 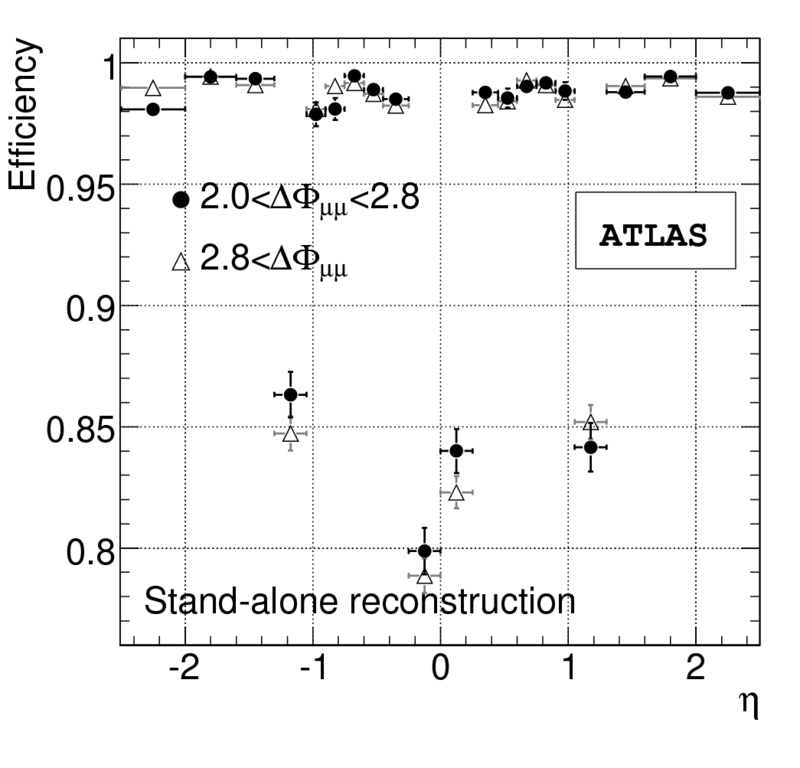 2: ATLAS muon spectrometer integrated magnetic field strength as a function of . Fig. 3: Number of detector stations traversed by muons passing through the muon spectrometeras a function of and . Fig. 4: Contributions to the momentum resolution for muons reconstructed in the Muon Spectrometer as a function of transverse momentum for . The alignment curve is for an uncertainty of 30~ m in the chamber positions. Fig. 5: True (left), (center) and isolation (right) distributions for the direct muons (top), indirect muons (second from top), (mass 2 \TeV) direct muons (third from top) and muons (bottom). Note that the range is different in each of the plots of that variable. Fig. 6: Standalone efficiency and fake rate as functions of true for Muonboy (left) and Moore/Muid (right) for direct muons in at low (top) and high (bottom) luminosity. In the efficiency plots, the upper curve (blue) is the efficiency to find the muon while the lower curve (green) additionally requires a good match ( ) between reconstructed and true track parameters. Fake rates are shown for a variety of thresholds. Fig. 7: Standalone fractional momentum resolution ( ) as function of (top) and (2nd row) and tails in that parameter also as functions of $\eta$ (3rd row) and (bottom). All are for both Muonboy (left) and Moore/Muid (right). The tail is the fraction of reconstructed muons with magnitude of outside a range and is shown for a wide range of values. The last tail curve (red, ``charge'') includes only muons reconstructed with the wrong charge sign. The 4th tail curve (yellow, ``2X high'') includes these and those with momentum magnitude more than two times the true value. Fig. 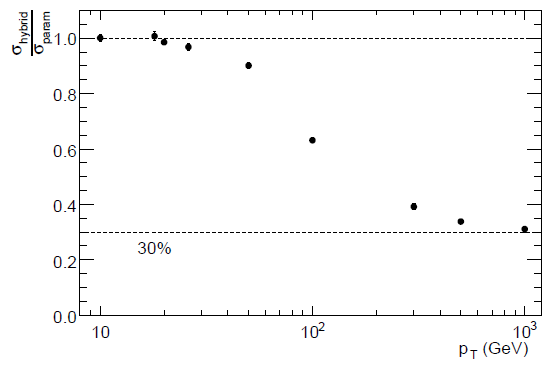 8: Inner detector direct muon efficiency as a function of true at low (left) and high (right) luminosity. In each figure, the upper curve (blue) is the efficiency to find the muon while the lower curve (green) additionally requires a good match ( ) between reconstructed and true track parameters. The efficiency is for GeV/c. Fig. 9: Combined muon efficiency and fake rate for Staco (left) and Muid (right) as functions of true for direct muons in at low (top) and high (bottom) luminosity. In each efficiency plot, the upper curve (blue) is the efficiency to find the muon while the lower curve (green) additionally requires a good match ( ) between reconstructed and true track parameters. The efficiencies are for . Fake rates are shown for a variety of thresholds. Fig. 10: Distributions of for direct muons (top) and fakes (third from top). The fakes are shown for a variety of thresholds. 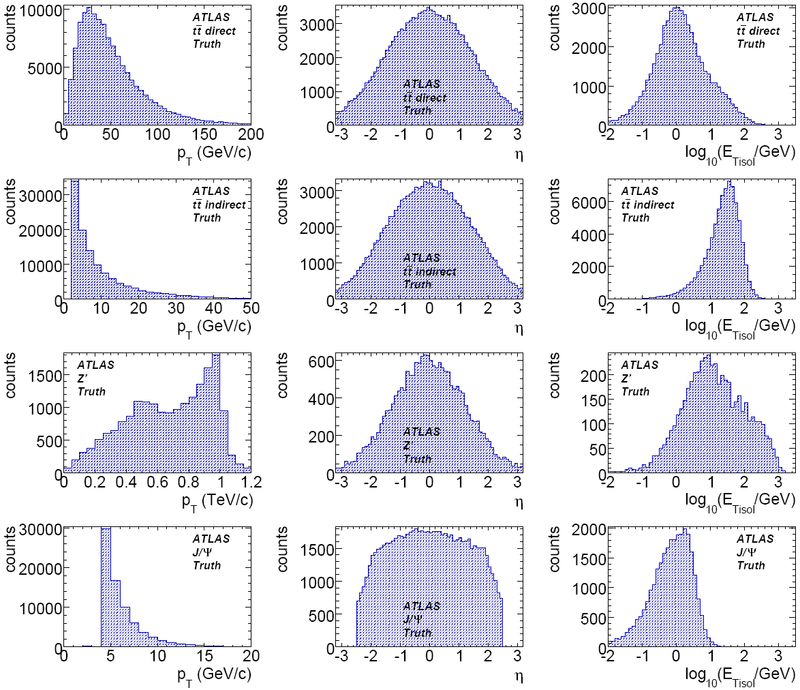 The second row shows the efficiency as function of when muons above that value are rejected. The bottom row shows the fake rates as a function of efficiency as that threshold is varied. All are shown for both Staco (left) and Muid (right). The sharp drops in the Staco distribution come from cuts on that quantity made during reconstruction, i.e. before filling the output muon collection. Fig. 11: Combined muon fractional momentum resolution ( ) as function of (top) and (2nd row) and tails in that parameter also as functions of (3rd row) and (bottom). All are for both Staco (left) and Muid (right). The tail is the fraction of reconstructed muons with magnitude of outside a range and is shown for a wide range of values. The last tail curve (red, ``charge'') includes only muons reconstructed with the wrong charge sign. The 4th tail curve (yellow, ``2X high'') includes these and those with momentum magnitude more than two times the true value. Fig. 12: MuGirl efficiency (left) and fake rates (right) as a function of true in at low (top) and high (bottom) luminosity. In each efficiency plot, the upper curve (blue) is the efficiency to find the muon while the lower curve (green) additionally requires a good match ( ) between reconstructed and true track parameters. The efficiency is for muons with true GeV/c. Fake rates are presented for a variety of $\pt$ thresholds. Fig. 13: MuGirl fractional momentum resolution ( ) as a function of (top) and (bottom). Both the distribution (left) and tails (right) are shown for each. 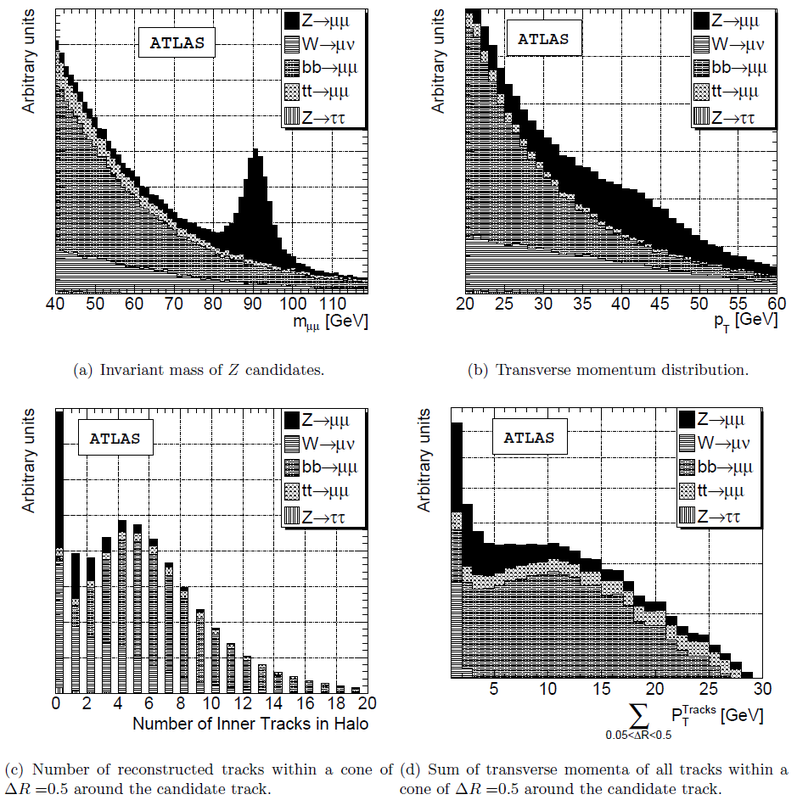 The tail is the fraction of reconstructed muons with magnitude of residual greater than a threshold and results are shown for a variety of thresholds. The last tail curve (red, ``charge'') includes only muons reconstructed with the wrong charge sign. The 4th tail curve (yellow, ``2X high'') includes these and those with momentum magnitude more than two times the true value. Fig. 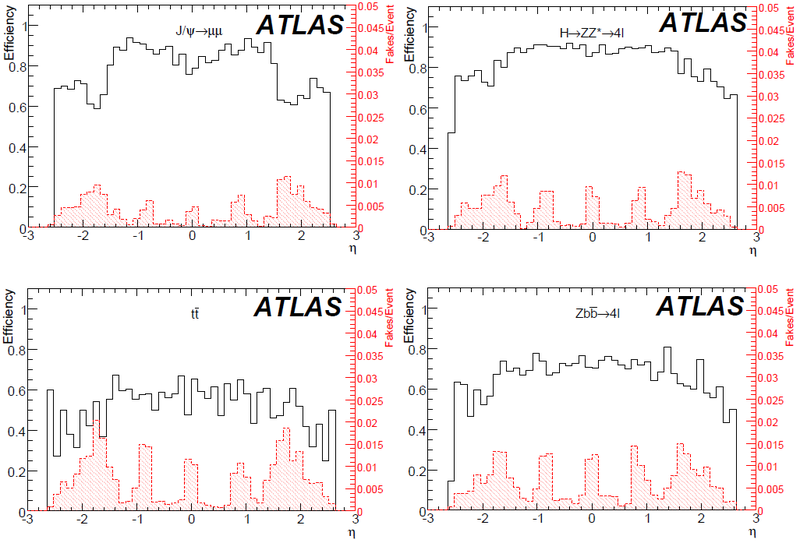 14: Muon efficiencies and fake rates for Staco+Atlas.MuTag (left) and Muid+Atlas.MuGirl (right) as functions of true in at low (top) and high (bottom) luminosity. In each efficiency plot, the upper curve (blue) is the efficiency to find the muon while the lower curve (green) additionally requires a good match ( ) between reconstructed and true track parameters. The muon selection is described in the text. The efficiency is calculated for true GeV/c. The fake rates are presented for a variety of thresholds. Fig. 15: Low- muon finding efficiencies for combined muons alone and combined plus tagged for the Staco (left) and Muid (right) collections. Results are show for the indirect selection. The other samples show similar behavior but have much poorer statistics at low- . The efficiency is calculated for muons with . 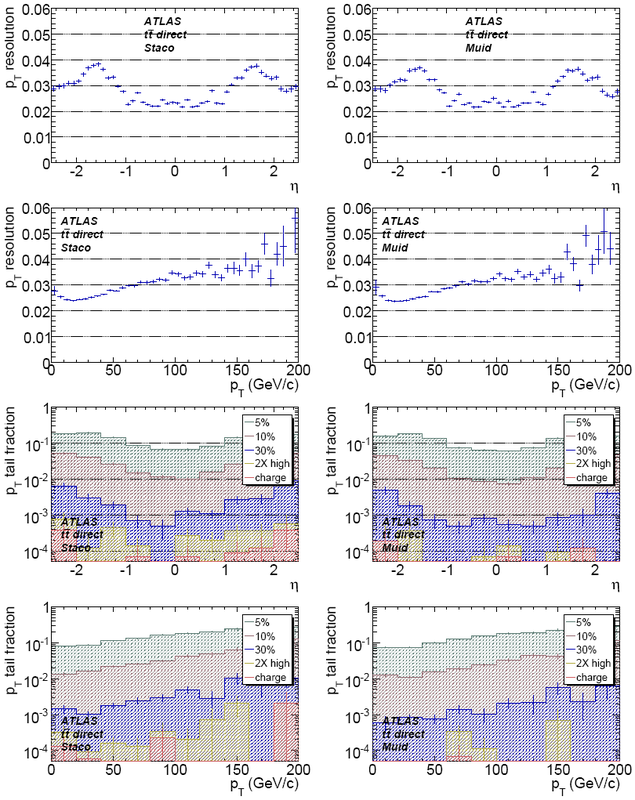 Section "Muons in the ATLAS Calorimeters: Energy Loss Corrections and Muon Tagging"
Fig. 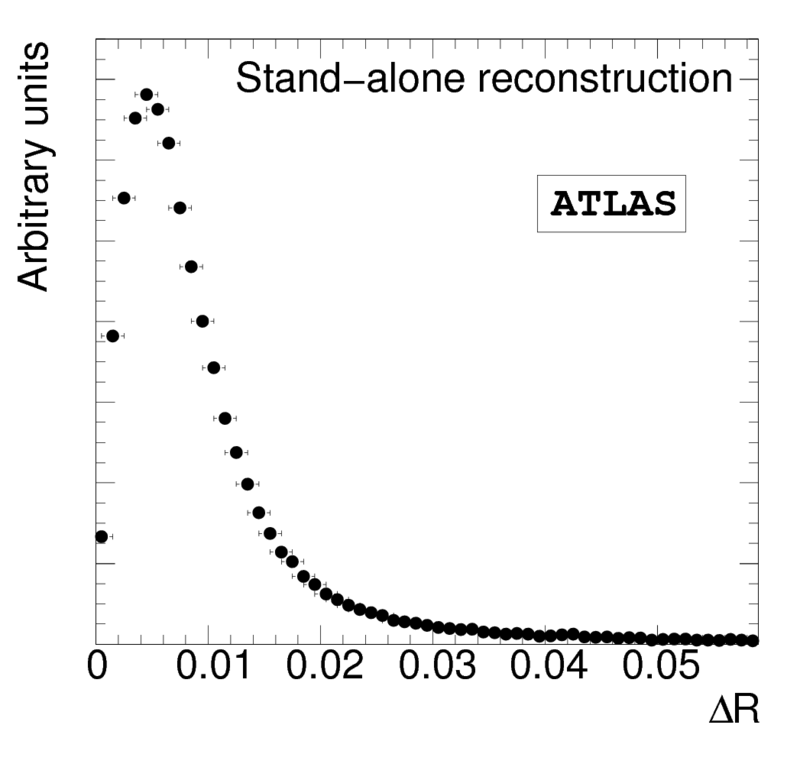 1: Material distribution before the muon spectrometer in ATLAS as a function of . The material is expressed in radiation lengths ( ). Fig. 2: Left: 3-D view of the tracking geometry up to the muon spectrometer. 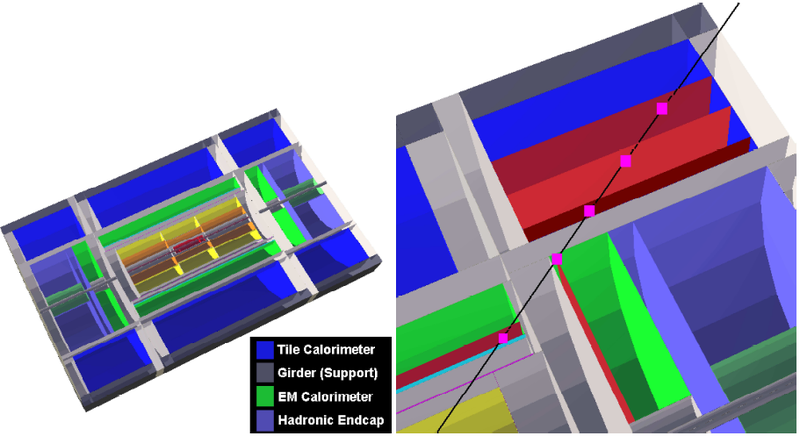 Right: Example set of energy loss update layers (shown as additional surfaces with respect to the figure on the left; update positions shown as squares) created during the extrapolation of a track (black line) through the calorimeter. Fig. 3: Calculated difference between the calorimeter entrance and exit coordinates ( , left, and , right) for 10 GeV (solid squares) and 100 GeV muons as a function of of the muon at the interaction point. The lack of mirror symmetry is due to the combined effect of the return flux of the solenoid (unidirectional) and the toroidal magnetic field (symmetric around the axis). Fig. 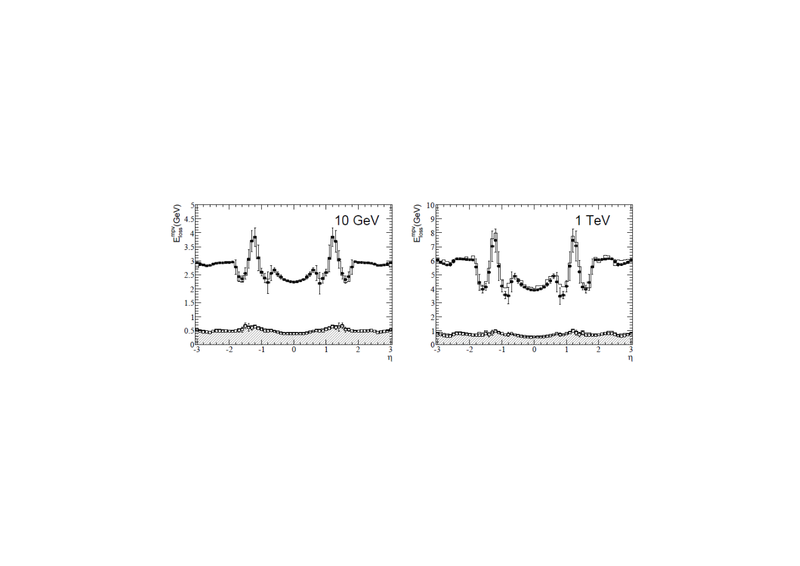 4: Distribution of the energy loss of muons passing through the calorimeters ( ) as obtained for 10 GeV muons (left) and 1 TeV muons (right) fitted to Landau distributions (solid line). Fig. 5: Parameterization of the (left) and (right) of the Landau distribution as a function of muon momentum for different regions. One sees a good agreement between the GEANT4 values and the parameterization. Fig. 6: Left: Fit to the most probable value and width of the Landau distribution as a function of thickness of iron for muons of momentum 200 GeV. The fitting function has the form . Right: Fit to the parameters and for the most probable value of the energy loss in lead as a function of muon momentum. Fig. 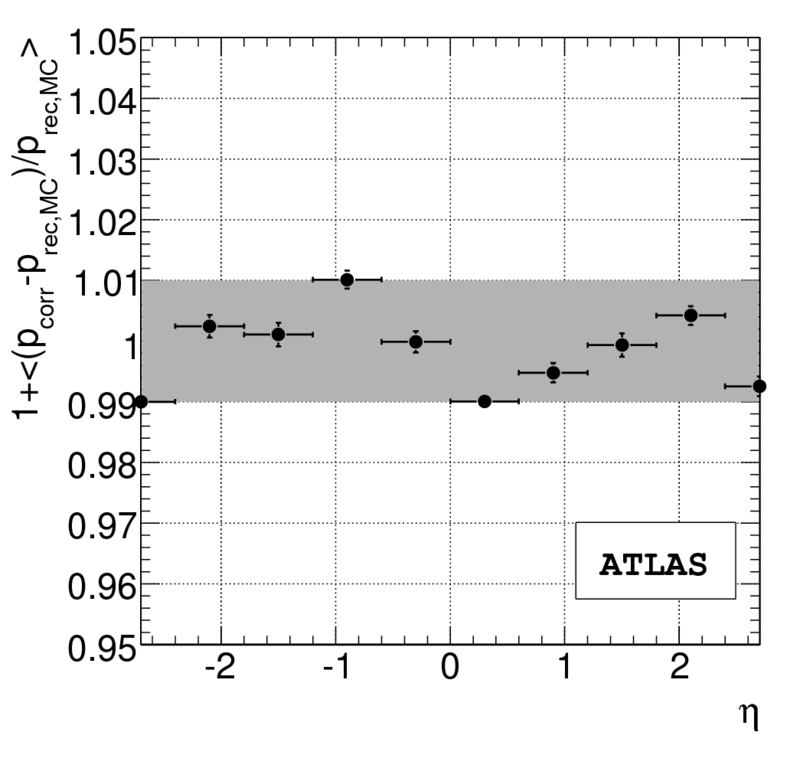 7: Most probable value of the energy loss as parameterized in the geometry of the ATLAS tracking (points) and in GEANT4 for muons of momentum 10 GeV (left) and 1 TeV (right) as a function of pseudorapidity. The solid line and points correspond to the energy loss of muons propagating from the beam pipe to the exit of the hadronic calorimeters. 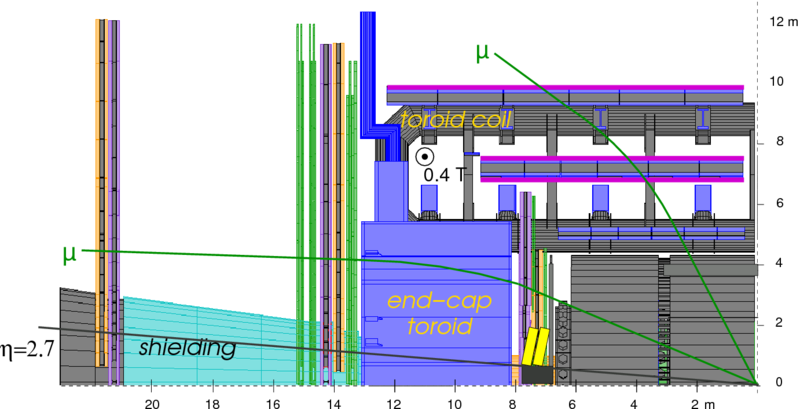 The filled histogram and hollow points correspond to the energy loss of muons propagating from the beam pipe to the entrance of the hadronic calorimeters. Fig. 8: Distribution of the muon energy deposited in one electromagnetic calorimeter cell by 15 GeV muons, fitted to a Landau function convolved with a gaussian. 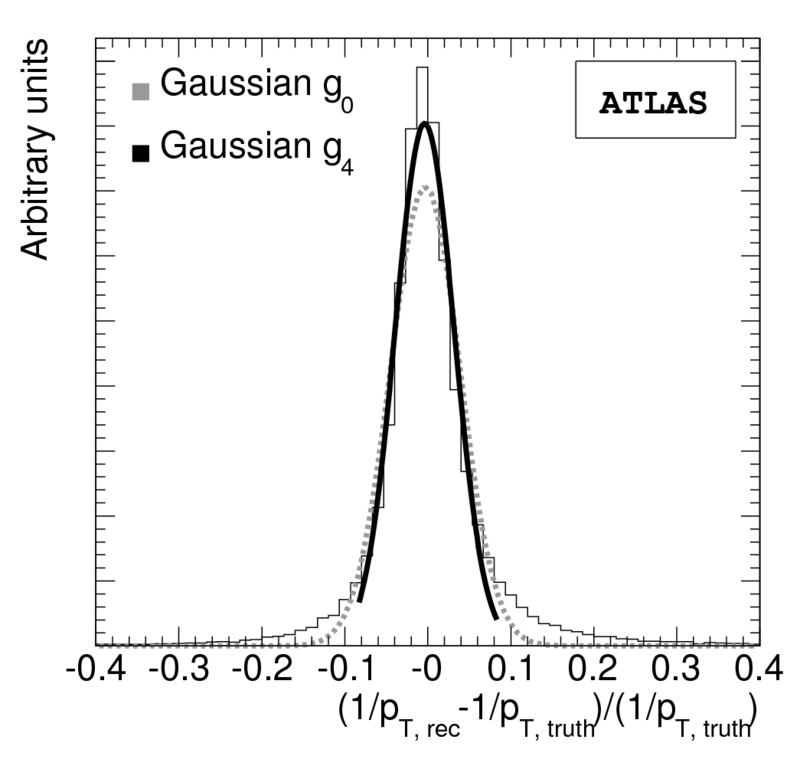 The gaussians on the left of each plot are the distributions of the noise. 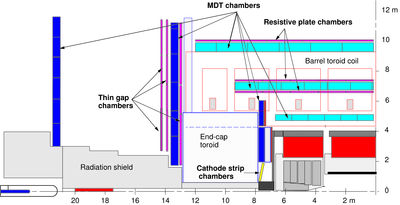 Left (right): energy deposit in a cell belonging to the first (middle) longitudinal sampling traversed by the muon. The energy is the sum of the energies of the (up to two) cells belonging to the muon cluster. The data were collected in the 2004 Combined Test Beam. Fig. 9: Example of the isolated muon signal as measured at in the whole tower (left) and in the last radial compartment (right). The narrow peaks represent the corresponding noise. The energy is measured in units of collected charge. For a muon 1 pC corresponds to roughly 1 GeV, yielding a noise width of roughly 40 MeV for the last radial compartment. The data were collected in test beams in 2002 and 2003. Fig. 10: Illustration of the Straight Line (left) and Track Update (right) concepts. Fig. 11: Comparison between the average measured transverse energy deposition (points) and true energy lost between the beam-pipe and the muon spectrometer (line) for muons of momentum 10 GeV (left), 100 GeV (center) and 300 GeV (right). The errors shown are statistical only. Fig. 12: Distribution of the isolation energy in the electromagnetic ( ) (left) and hadronic calorimeters ( ) (right) in muons from a sample without pile-up. Fig. 13: Distribution of the number of inner detector tracks (including the muon track) with around the muon spectrometer track, after the calorimeter isolation and pT threshold cuts are applied to muons in a sample. Fig. 14: Rejection of the background as a function of the signal efficiency. Different radii ( ) are compared for absolute, left, and normalized (with respect to muon ), right, calorimeter isolation. No pile-up events were simulated. Fig. 15: Ratio of the energy loss resolution for the Hybrid Method with respect to the parameterization alone for single muons. Fig. 16: Rejection of the background as a function of the signal efficiency. 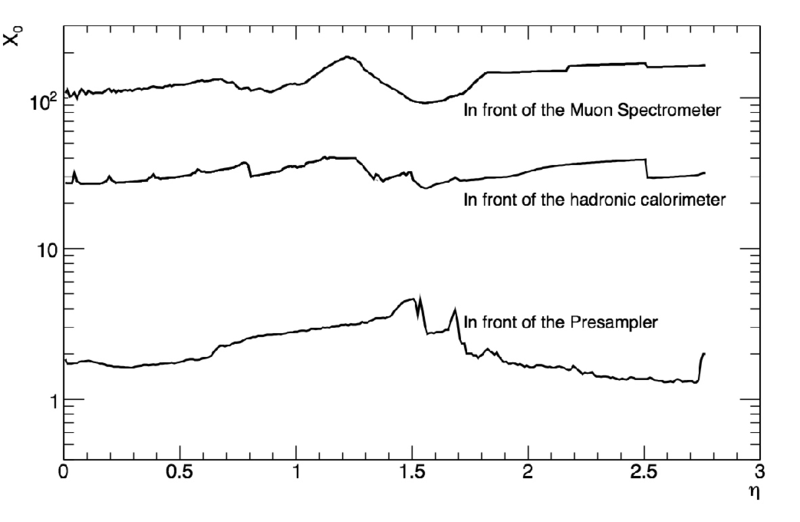 Different radii ( ) are compared for absolute, left, and normalized (with respect to muon ), right, calorimeter isolation. No pile-up events were simulated. Fig. 17: Left: Muon reconstruction bias for different algorithms as a function of muon . Right: Muon reconstruction resolution for different algorithms as a function of muon . 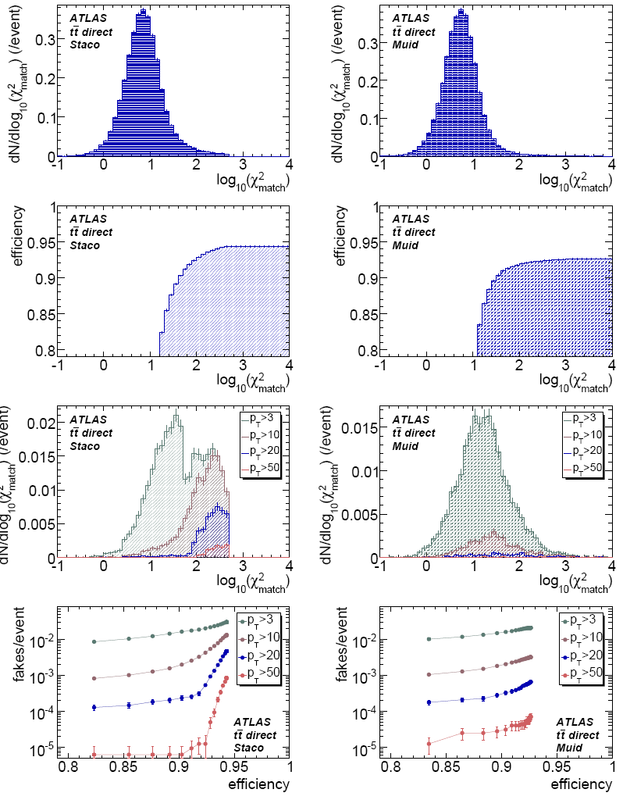 These plots were produced with the Muonboy/STACO algorithms for muon reconstruction, but similar performance is obtained with the MOORE/Muid algorithms. Fig. 18: Left: Reconstruction resolution of the $Z$ peak for different algorithms. Right: Reconstruction resolution of the peak for a of mass 1 TeV for different algorithms. 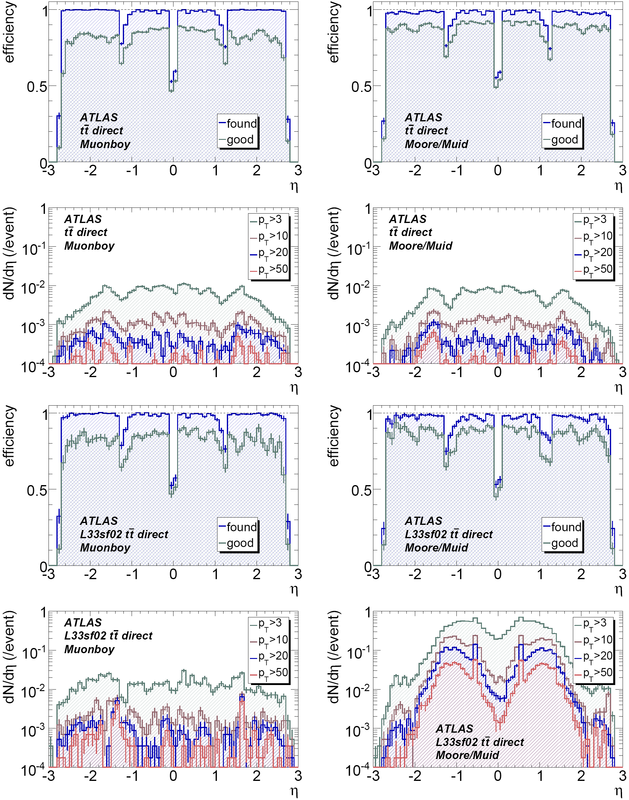 These plots were produced with the MOORE/Muid algorithms for muon reconstruction, but similar performance is obtained with the Muonboy/STACO algorithms. Fig. 19: Left: Reconstruction resolution of the peak for an algorithm using muon spectrometer standalone tracks and the parameterized energy loss correction (filled histogram) and an algorithm using a combination of a parameterization and the calorimeter measurement for the energy loss correction (empty histogram). Right: Reconstruction resolution of the peak for a of mass 1 TeV for the same algorithms. Fig. 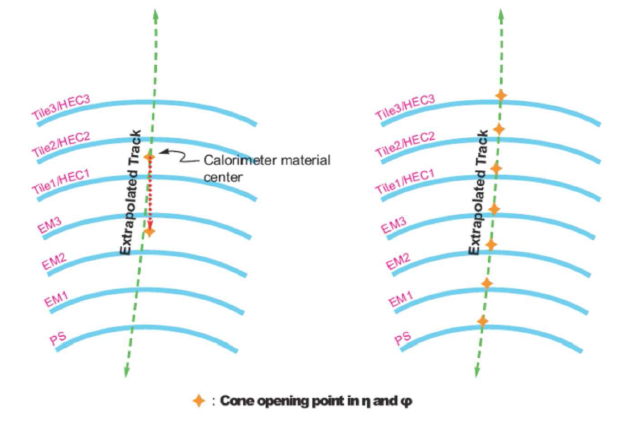 20: Energy found in the cell traversed by the extrapolated track (solid line) and the surrounding cells (dashed line) in the TileCal (left) and in the HEC (right). 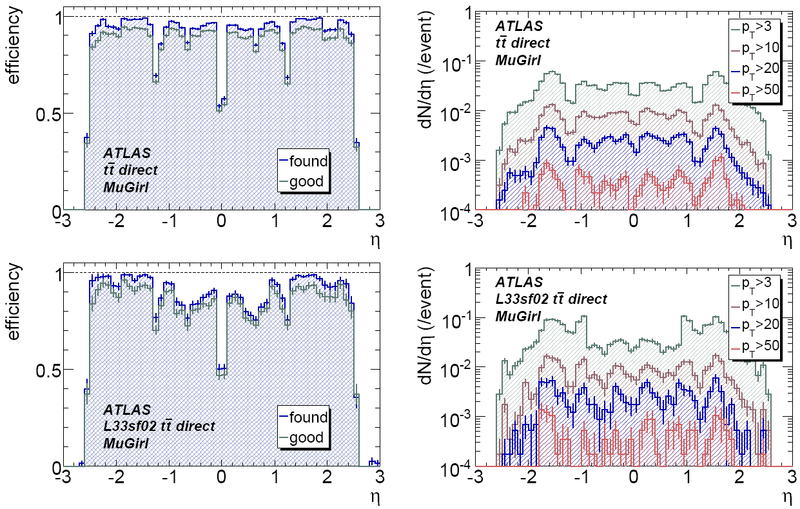 Distributions obtained for momentum 100 GeV muons. Fig. 21: Efficiency (and fakes per event, right axis in red and shaded histograms) vs for different samples. Top left: . Top right: . Bottom left: . Bottom right: . Fig. 22: Reconstructed Higgs peak in the invariant mass reconstruction for the standard combined muons (left) and for combined muons together with inner detector muons tagged by CaloMuonTag in the (right). Fig. 23: Reconstructed invariant mass reconstruction for standard combined muons (left) and for combined muons together with inner detector muons tagged by CaloMuonTag in the region (right). 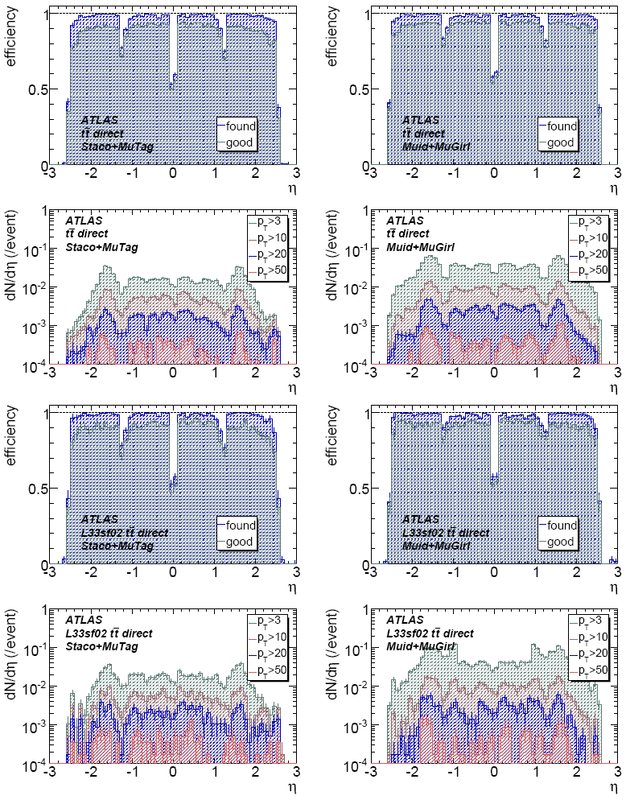 Section "In-Situ Determination of the Performance of the ATLAS Muon Spectrometer"
Fig. 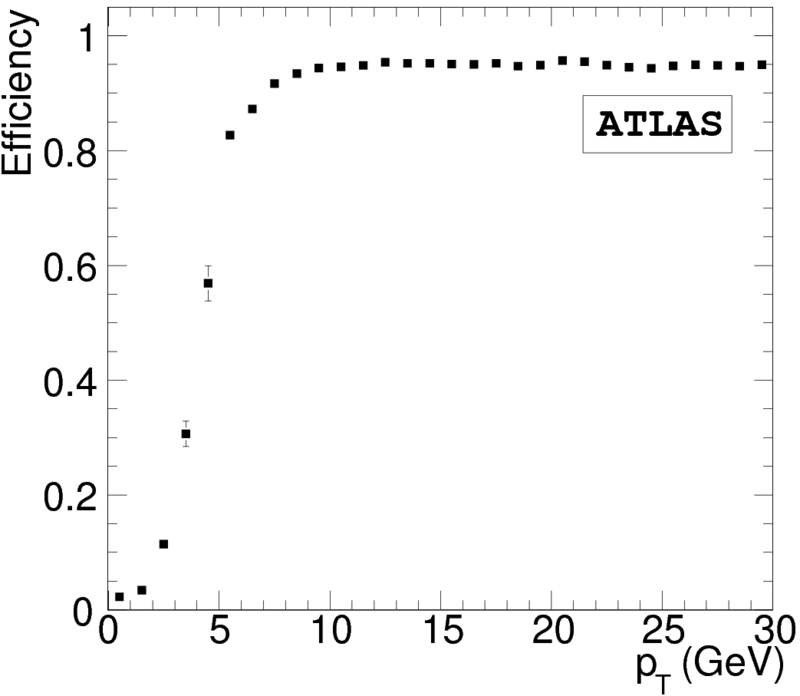 1: Sketch of a quadrant of the ATLAS muon spectrometer. Fig. 2: Distribution of the distance of reconstructed from generated muons in a 50 GeV single muon Monte Carlo sample. Fig. 3: Illustration of the iterative fit of normal distributions to the fractional deviation of the reconstructed inverse momentum from the generated inverse momentum. is the fitted Gaussian of iteration step 0. is the fitted Gaussian of final iteration step 4. Fig. 4: Efficiencies of the reconstruction of tracks in the muon spectrometer. 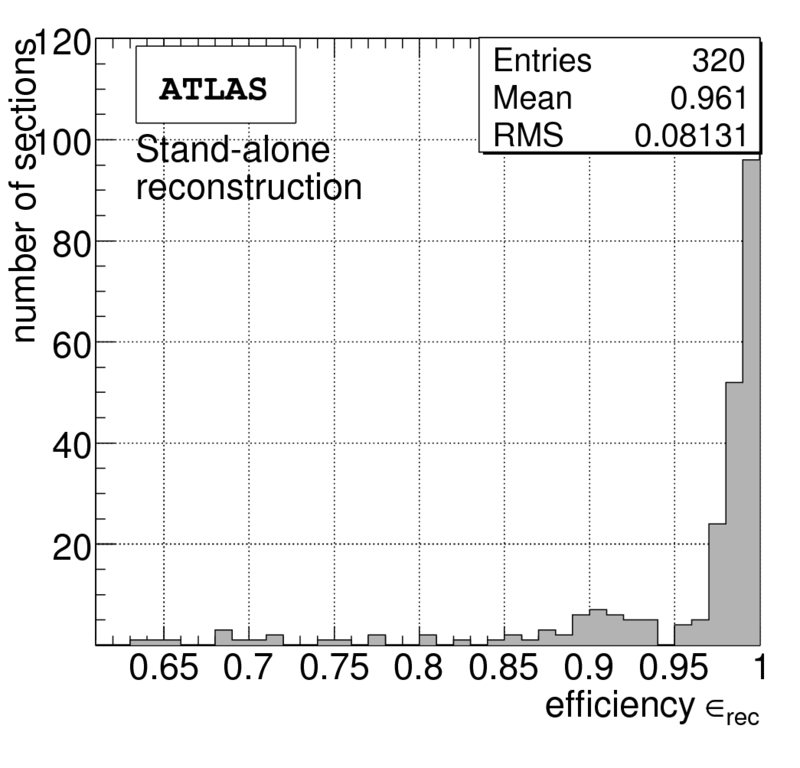 (a) Reconstruction efficiency vs. and for muons of GeV. (b) Reconstruction efficiency vs. integrated over up to and . Fig. 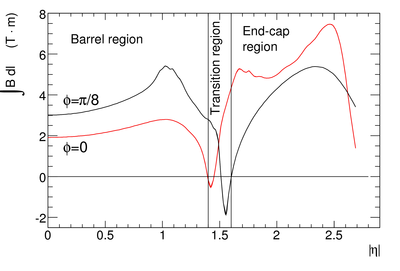 5: Stand-alone momentum resolution integrated over and as a function of for the barrel (5(a)) and the end-cap region (5(b)). Fig. 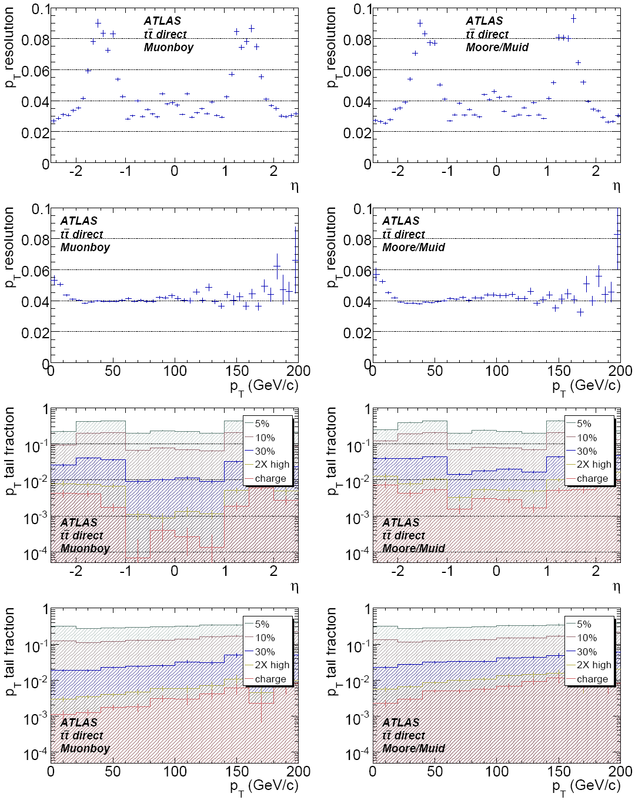 6: Comparison of reconstruction efficiency for an aligned muon spectrometer and a misaligned muon spectrometer with a average positioning uncertainty of 1 mm for a simulated single muon sample. (a) Efficiency vs. integrated over for GeV. (b) Efficiency vs. integrated over for pT =50 GeV. Fig. 7: Comparison of the fractional -resolution for an aligned muon spectrometer and a misaligned muon spectrometer. (a) Overall -resolution. (b) -resolution vs. . Fig. 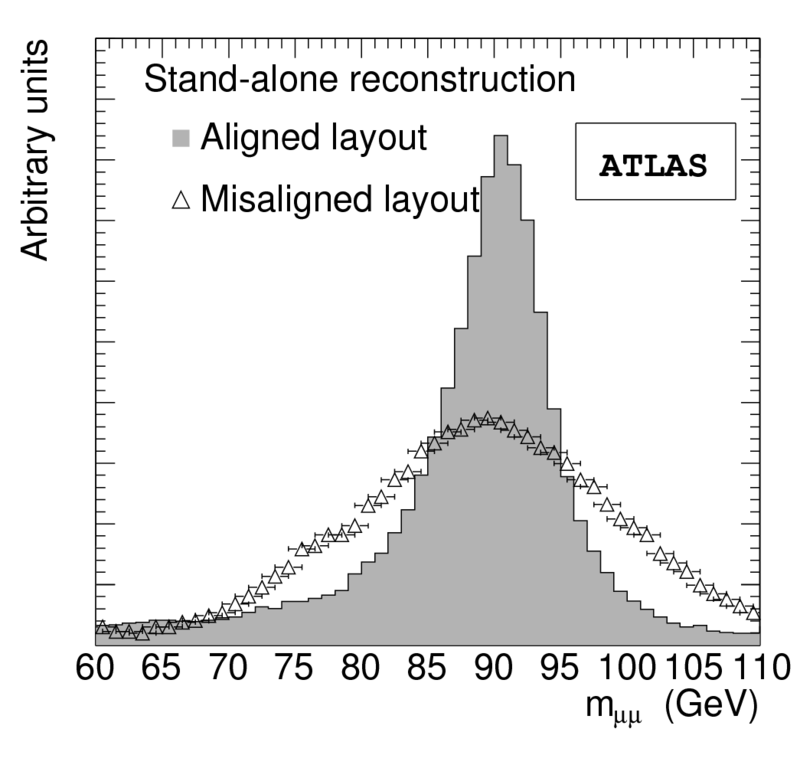 8: Reconstructed Z boson mass distribution for an aligned and a misaligned muon spectrometer layout (misalignment 1 mm). Fig. 9: Width of the Z resonance peak including the natural width of the Z vs. misalignment parameter . Fig. 10: Schematic illustration of the tag and probe method. Fig. 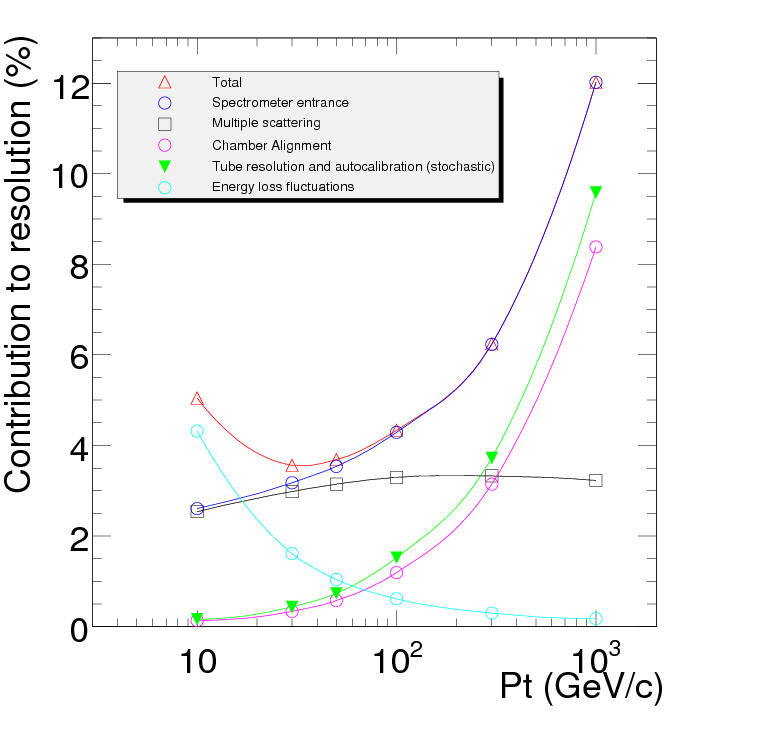 11: : Reconstructed quantities for Z candidate events only using inner detector tracks with a transverse momentum above 6 GeV and no further cuts for signal and background processes. (a) Invariant mass of Z candidates. (b) Transverse momentum distribution. (c) Number of reconstructed tracks within a cone of . 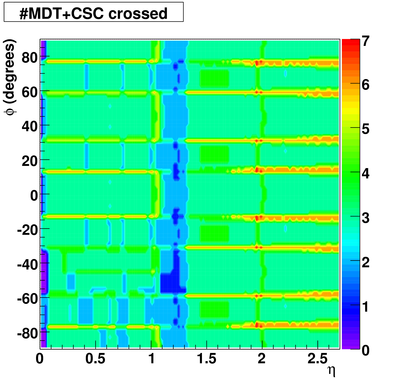 (d) Sum of transverse momenta of all tracks within a cone of around the candidate track. Fig. 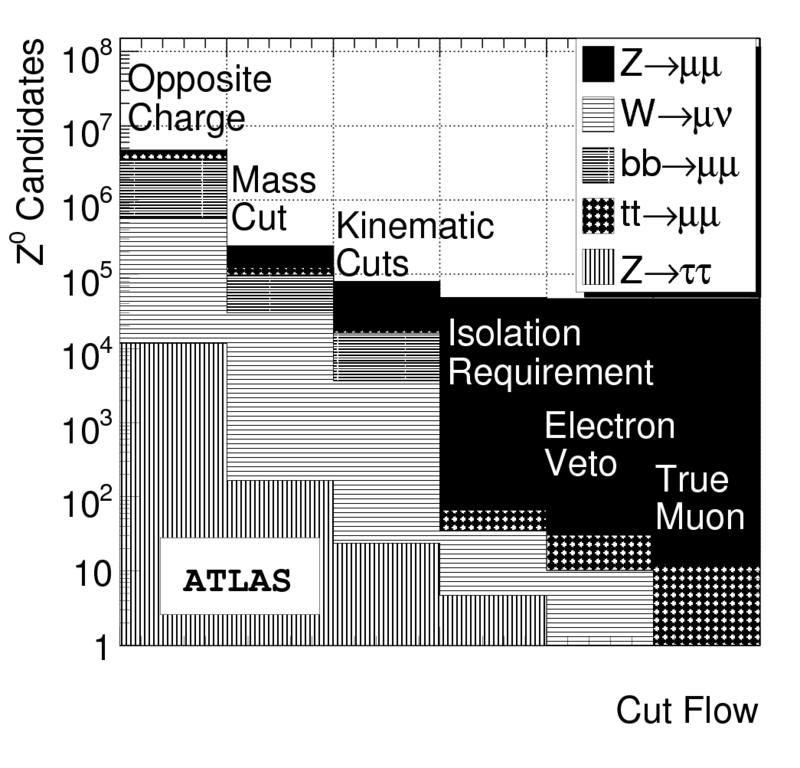 12: Cut-flow diagram for probe muon tracks: (0) opposite charge requirement, (1) invariant mass requirement, (2) kinematic cuts, (3) isolation requirements, (4) electron veto, (5) found at least one track in the muon spectrometer. Fig. 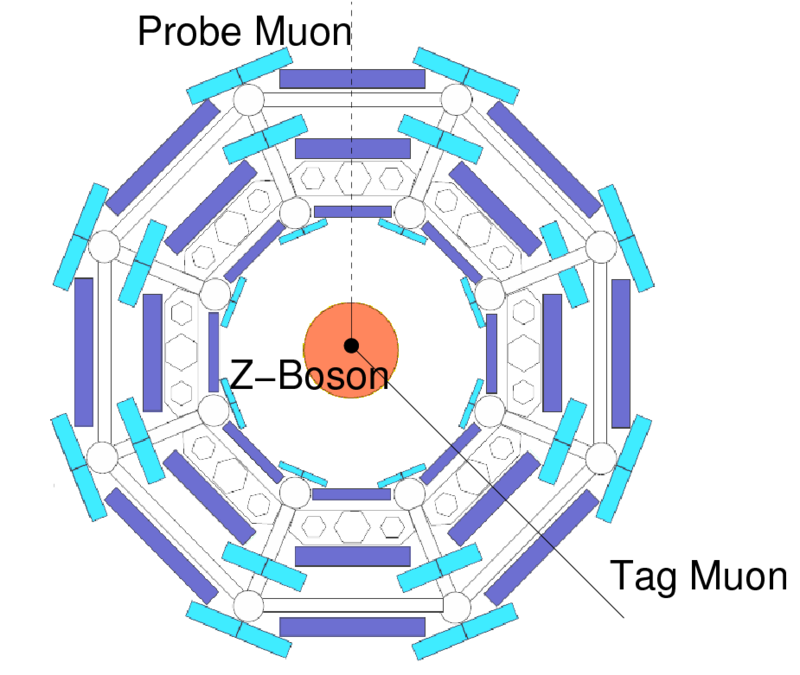 13: Illustration of the choosen and -binning of the muon spectrometer. Fig. 14: Comparison of the muon reconstruction efficiency of the muon spectrometer vs. and determined by the tag and probe method and via the Monte Carlo truth information. Fig. 15: Distribution of muon reconstruction efficiency of the 320 muon spectrometer regions. Fig. 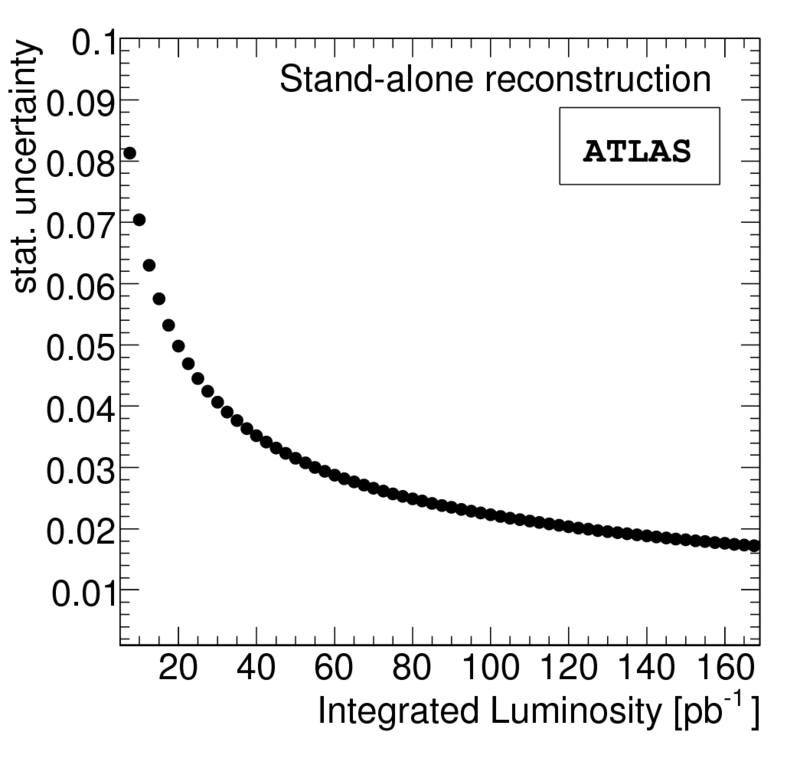 16: Average statistical error of reconstruction efficiency of the 320 regions vs. integrated luminosity. Fig. 17: Reconstruction efficiency of the muon spectrometer for muon tracks which have been triggered and muon tracks which have not been triggered. Fig. 19: Expected invariant masses resulting from two inner tracks where both muons must be matched to a muon spectrometer track (a) or at least one of the muons must be matched to a muon spectrometer tracks (b). Fig. 20: Dependence of on integrated over and for events in the second scenario of a misaligned detector.